Resistance training can improve several benefits to body composition, health, and quality of life . However, resistance training can increase the production of free radicals resulting in oxidation of the cellular components, such as lipids and proteins . 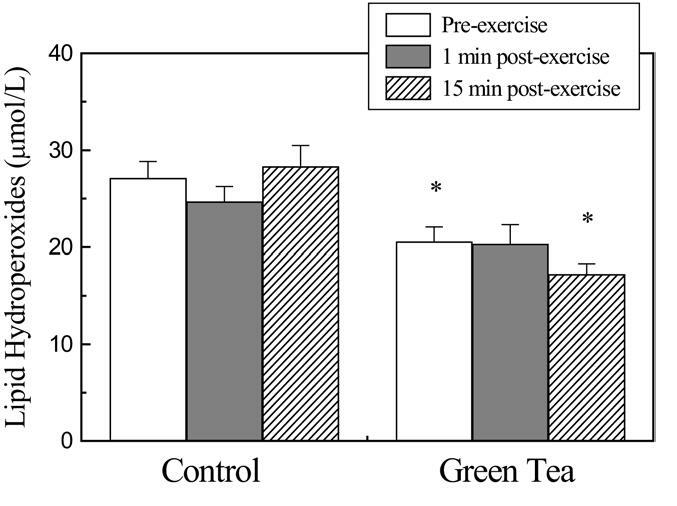 Studies show that green tea consumption reduces oxidative stress post workout . Panza, Vilma Simões Pereira, et al. investigated the effects of the consumption of Green Tea for 7 days on biomarkers of oxidative stress in 14 young men undergoing resistance exercise. In the control period participants drank 200 ml of water three times per day (morning, afternoon, and night) for 7 days. After this control period, the volunteers consumed 200 ml of green tea (10 mg of dried leaves for every millilitre of hot water), three times per day for 7 days. The exercise protocol was performed using a bench press, bar and free weights. The Green Tea group had significantly lower lipid hydroperoxide (intermediates of oxidative degradation of lipids – lipid peroxidation ) concentrations just before and at 15 min after exercise than the control group, indicating lower cell damage (Pic). Pic. – Plasma concentrations of lipid hydroperoxide before and at 1 and 15 min after exercise in the control and green tea groups. This study suggests that regular Green Tea consumption may offer a protective effect against oxidative damaged induced by resistance exercise. The scientists are not consent regarding the need of antioxidant supplementation for athletes who have a balanced diet. [5-7] It was proposed that decreasing free radical production through the excessive use of antioxidants could inhibit the signaling induced by reactive oxygen species, necessary to specific cellular adaptations to exercise [8,9]. However, the intake of a diet rich in antioxidants is still the best recommendation to minimize the harmful effects of free radicals resulting from exercise [6,7]. Stone, M. H., et al. “Health-and performance-related potential of resistance training.” Sports medicine (Auckland, NZ) 11.4 (1991): 210. McBride, Jeffrey M., et al. “Effect of resistance exercise on free radical production.” Medicine and science in sports and exercise 30.1 (1998): 67. Panza, Vilma Simões Pereira, et al. “Consumption of green tea favorably affects oxidative stress markers in weight-trained men.” Nutrition 24.5 (2008): 433-442. Girotti, Albert W. “Lipid hydroperoxide generation, turnover, and effector action in biological systems.” Journal of lipid research 39.8 (1998): 1529-1542. Banerjee, Alok K., et al. “Oxidant, antioxidant and physical exercise.” Molecular and cellular biochemistry 253.1 (2003): 307-312. Williams, Sarah L., et al. “Antioxidant requirements of endurance athletes: implications for health.” Nutrition reviews 64.3 (2006): 93-108. Urso, Maria L., and Priscilla M. Clarkson. “Oxidative stress, exercise, and antioxidant supplementation.” Toxicology 189.1 (2003): 41-54. Gomez‐Cabrera, Mari‐Carmen, et al. “Decreasing xanthine oxidase‐mediated oxidative stress prevents useful cellular adaptations to exercise in rats.” The Journal of physiology 567.1 (2005): 113-120. Lauer, Nadine, et al. “Critical involvement of hydrogen peroxide in exercise-induced up-regulation of endothelial NO synthase.” Cardiovascular research 65.1 (2005): 254-262.